Having decided on your home’s storage space, here’re some tips on planning built-in storage. A sketch of the area for the built-in storage would be a good starting point and for the whole house, it’d be good to map out the respective rooms. This involves taking detailed measurements and it is important to be as accurate as possible. Fitted storage is particularly intolerant of mistakes, and any anomalies will be all too glaring once the cupboard is built and the shelves have gone up. Get help if you’re not confident doing the measurements yourself. The next step is to use the measurements taken to draw up a plan. I’d suggest using graph paper and work to a reasonable scale. This allows you to assess the impact of what you’d like to propose for the respective rooms. Once the plan is completed, try out different storage solutions. Take a look at catalogues and furniture showrooms to appreciate the common height and depth of fitted units so you don’t commission storage that is too tight or too roomy for what you intend to put into it. One way to avoid this is to draw up the shapes of fitted elements separately, using the same scale, cut them up and move them about on your drawing to test out suitable locations. At this point, I’d like to remind you to give free access to the storage contents; this means drawers can be pulled out easily and cupboard doors can swing open without hitting other furniture. The ingenious system shown below makes good use of a narrow kitchen. Using the pull-out shelves, the contents can be assessed from either side. 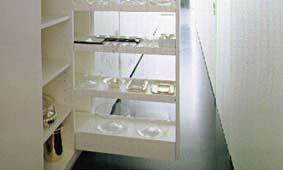 Here, the shelves are used to store glassware, but similar units can also be used as larder cupboards. It’s also important to include the quantity and dimensions of the object you’re intending to store. When in doubt, measure the item or items and add in a generous margin for future purchases. One good example of a popular built-in storage design is to include cubicles to provide useful means of organizing different types of belongings. This can be extended to cover an entire wall so the storage looks neat and well considered as in the examples below.